LaReina features a “Euro-deco” design, making it an ideal choice for today’s contemporary-styled home theaters. 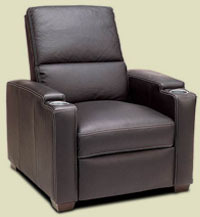 LaReina offers a bold, chiseled design, squared seatback, and slimmer, sleeker arms. Fine workmanship and impeccable quality are synonymous with Premiere’s line of MovieLounger™ theater seating and the LaReina proves this once again. 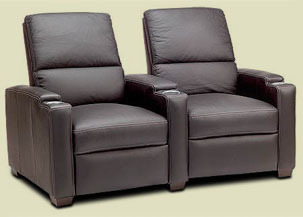 LaReina features a “Euro-deco” design, firmer seat cushion and smaller overall footprint, making it ideal for those looking for a full recliner in a more sleek and contemporary package. – Lifetime warranted frame- 5 years parts & labor on leathers- one year warranty on ultra suede. Try one on for size today and Come Home to Premiere.